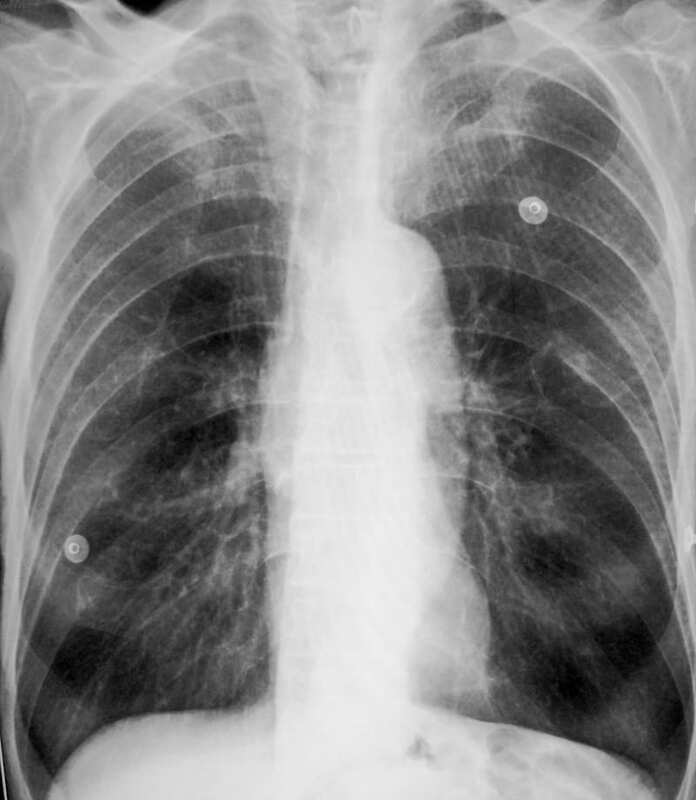 The presence of hyperexpanded emphysematous lungs within the chest. The long-term effects of hypoxic pulmonary vasoconstriction upon the right side of the heart, causing pulmonary hypertension and subsequent right atrial and right ventricular hypertrophy (i.e. cor pulmonale). Lung hyperexpansion causes external compression of the heart and lowering of the diaphragms, with consequent elongation and vertical orientation of the heart. Due to its fixed attachments to the great vessels, the heart undergoes clockwise rotation in the transverse plane, with movement of the right ventricle anteriorly and displacement of the left ventricle posteriorly. The presence of increased air between the heart and recording electrodes has a dampening effect, leading to reduced amplitude of the QRS complexes. Chronic hypoxaemia causes reflex vasoconstriction in the pulmonary arterioles (“hypoxic pulmonary vasoconstriction”), with consequent elevation of pulmonary arterial pressures. Destruction of lung tissue with loss of pulmonary capillaries increases the resistance of the pulmonary vascular bed by reducing its effective surface area. Over time, this chronic elevation of pulmonary arterial pressures results in compensatory right atrial and right ventricular hypertrophy. Rightward shift of the P wave axis with prominent P waves in the inferior leads and flattened or inverted P waves in leads I and aVL. Rightward shift of the QRS axis towards +90 degrees (vertical axis) or beyond (right axis deviation). Exaggerated atrial depolarisation causing PR and ST segments that “sag” below the TP baseline. Low voltage QRS complexes, especially in the left precordial leads (V4-6). Clockwise rotation of the heart with delayed R/S transition point in the precordial leads +/- persistent S wave in V6. There may be complete absence of R waves in leads V1-3 (the “SV1-SV2-SV3” pattern). 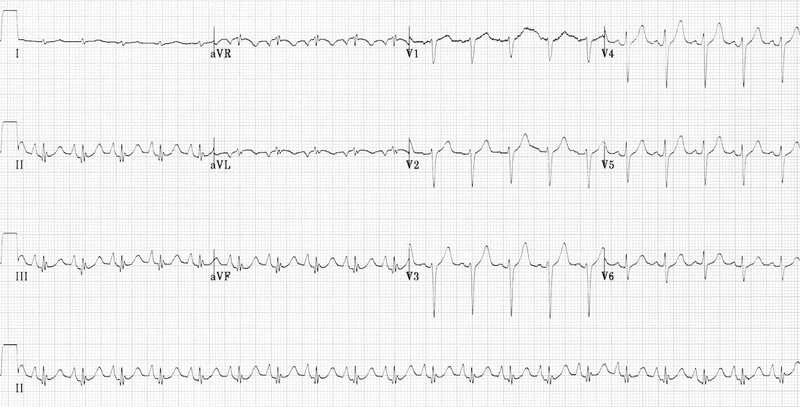 Multifocal atrial tachycardia – a rapid, irregular atrial tachycardia with at least 3 distinct P wave morphologies (associated with increased mortality in patients with COPD). 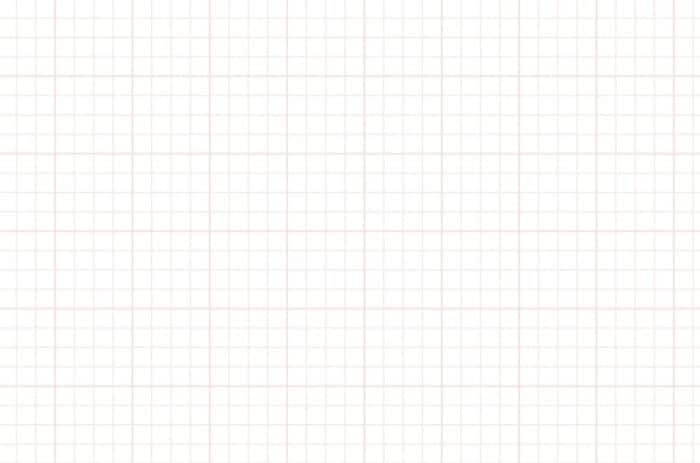 Rightward QRS axis (+90 degrees). Clockwise rotation of the heart with a delayed R/S transition point (transitional lead = V5). Absent R waves in the right precordial leads (SV1-SV2-SV3 pattern). Low voltages in the left-sided leads (I, aVL, V5-6). Sinus tachycardia may be due to breathlessness, hypoxia or bronchodilator therapy (e.g. salbutamol, theophylline). Rightward axis (+ 90 degrees). Low QRS voltages (most obvious in the limb leads). Clockwise rotation (transitional lead = V6). Virtually absent R waves in the right precordial leads (SV1-SV2-SV3 pattern). Rapid, irregular rhythm with multiple P-wave morphologies (best seen in the rhythm strip). 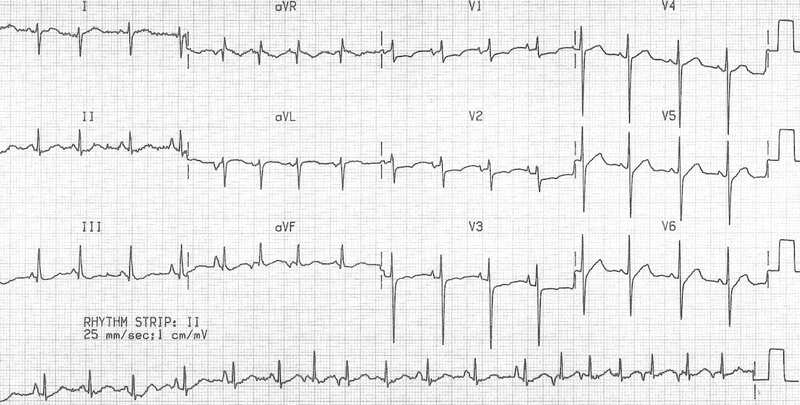 Right axis deviation, dominant R wave in V1 and deep S wave in V6 suggest right ventricular hypertrophy due to cor pulmonale.